Time for another dream bike photography and brief impressions. 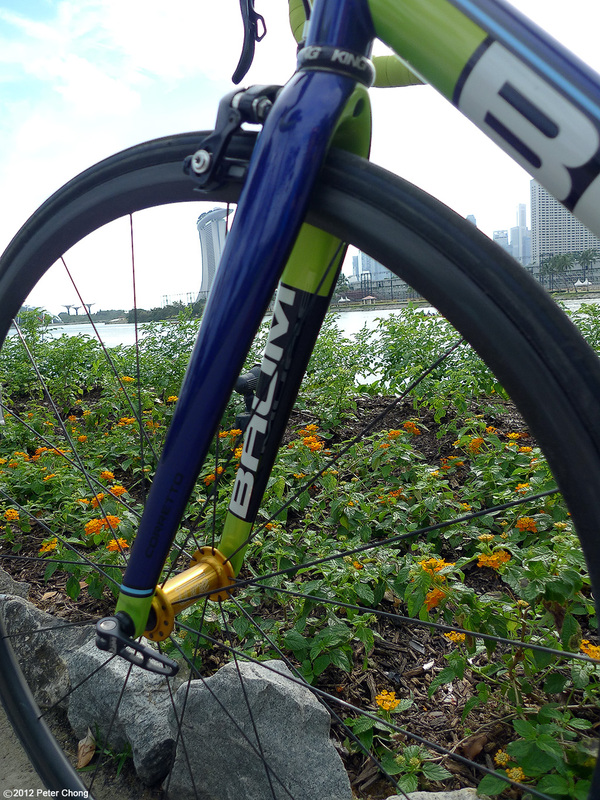 This time, a magnificent handmade bicycle from Australia, and one of the most sought after bike frames ever...the Baum! 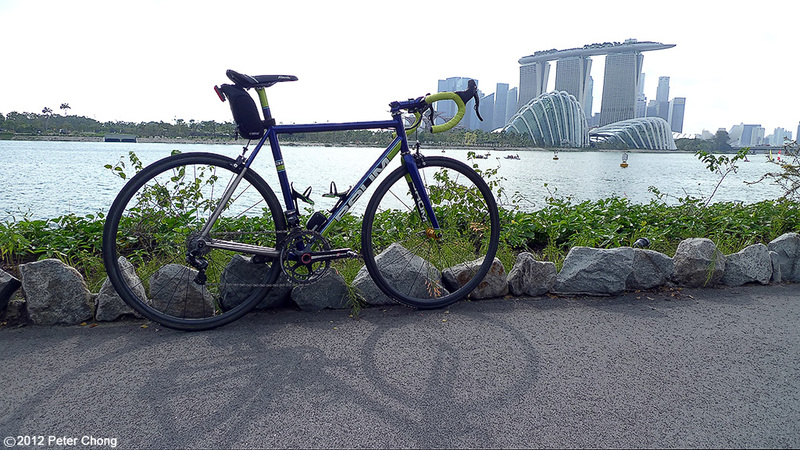 From the same good friend who loaned me his Zullo MazSilenus and Pegoretti Responsorium, here is his Baum Corretto. 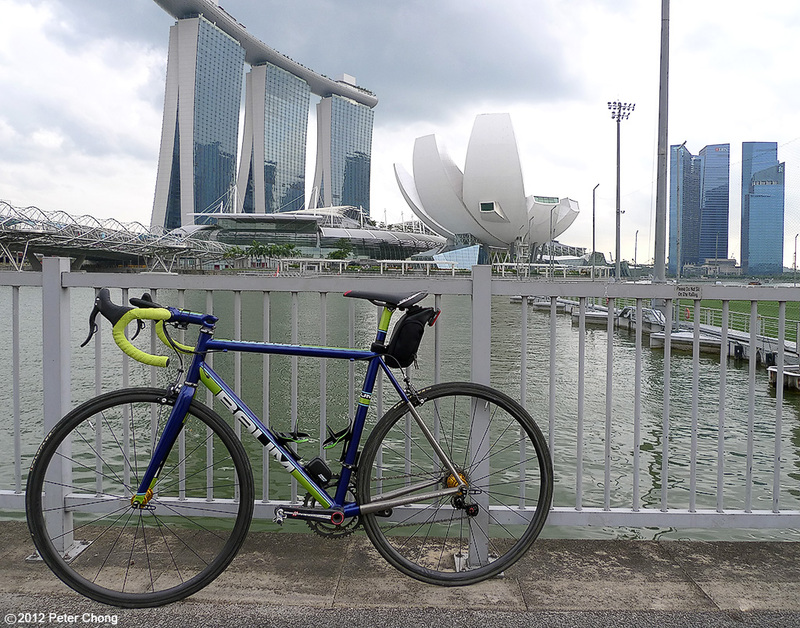 On the Floating Platform at the Marina Bay area overlooking the Marina Bay Sands and the Science Museum. As I mentioned in earlier bicycle posts, the world of the handmade bicycle is as elusive as the world of handmade independent watchmakers. Very few aspire to the art, and even fewer manage to make a namefor themselves. Darren Baum in Australia is one such distinguished individual. 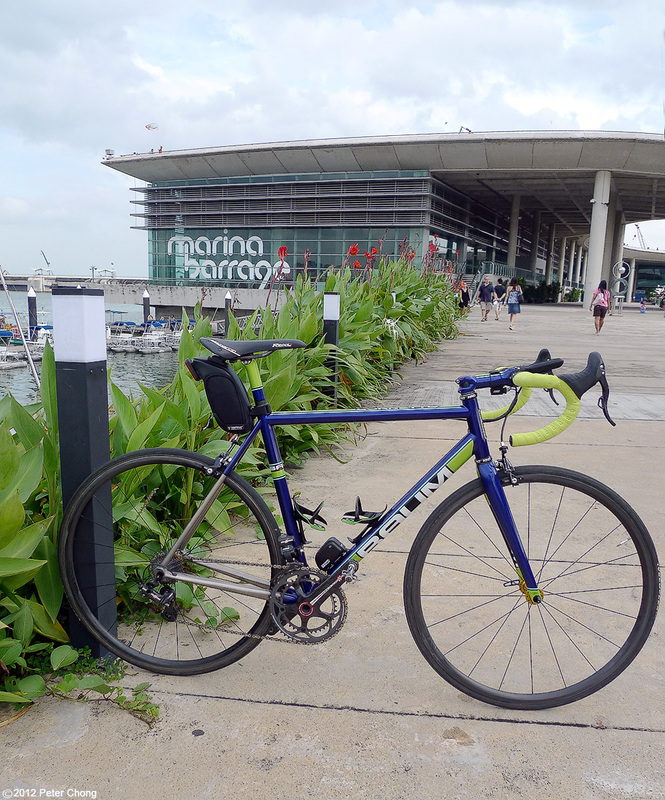 Just by the fountains at the Marina Barrage. His bikes have the reputation of great ridability and yet stiff, efficient and ability to compete with race bred bikes in terms of its ability to transfer every ounce of precious power from your legs to propel you forward. Race or relaxed geometry? Seems you don't have to choose. 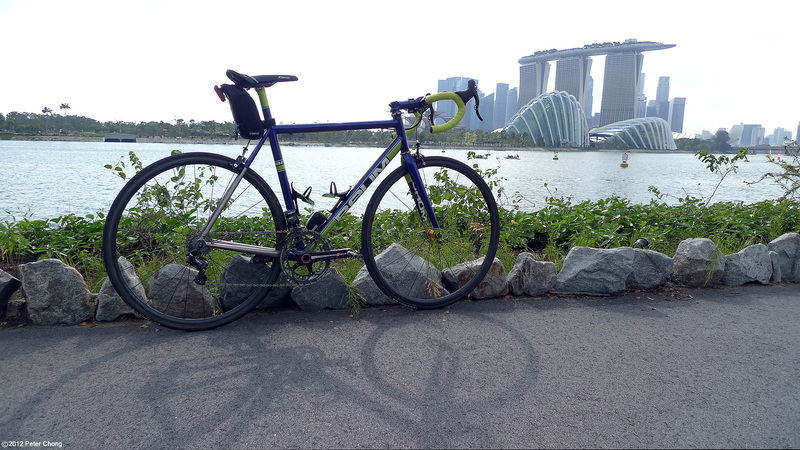 At Gardens by the Bay East, overlooking the Marina Bay with a view of the Singapore CBD. Click on the image for a 1920 wide wallpaper. 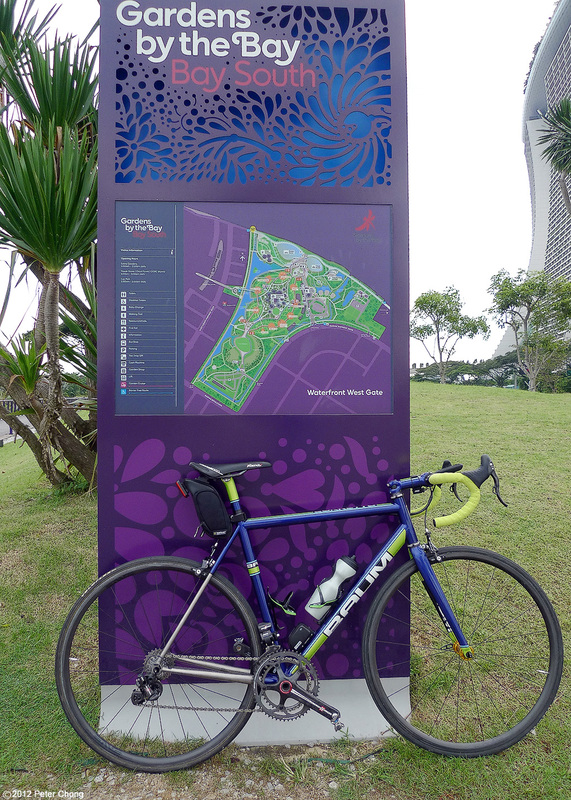 Click on the above picture for a full sized wallpaper of the magnificent bicycle with the Singapore skyline as shown from Gardens by the Bay East. Handbuilt in Australia, each bike is custom. 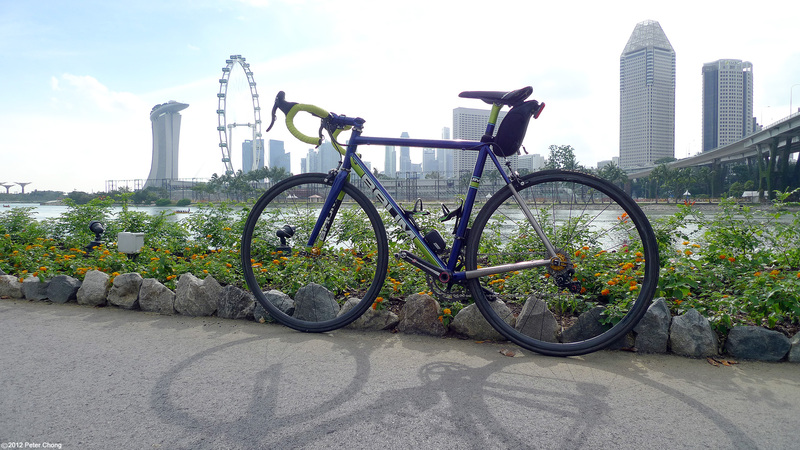 Darren takes into consideration the rider's weight, riding characteristics and intended usage of the bike. The bike featured today is the Baum Corretto. I am slightly bemused by the name...Baum...the surname of the creator means Tree in German. Corretto means correct in Italian (normally an espresso with a shot of grappa), and the bike is made in Australia. 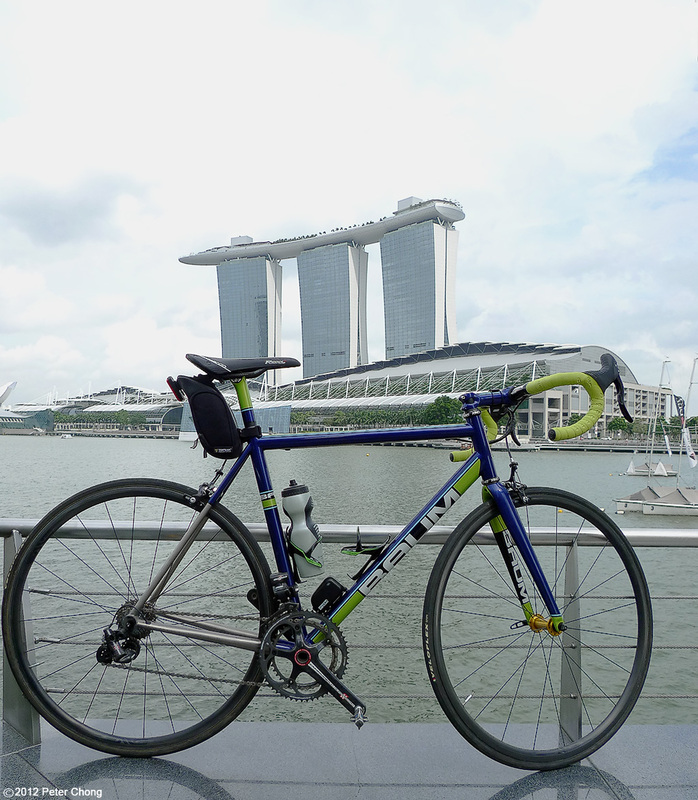 On the waterside just across from the Marina Bay Financial Centre, overlooking the Marina Bay Sands. Unlike many other custom builders who choose from a set of factory butted tubes and blend the tubes for the ride characteristic he is designing for, Darren uses straight gauge tubing for the Corretto, but internally or externally butts each individual tube himself to achieve what he envisions to be the best to achieve the ride goal. This level of attention to detail is almost unique and characterises the Baum builds. 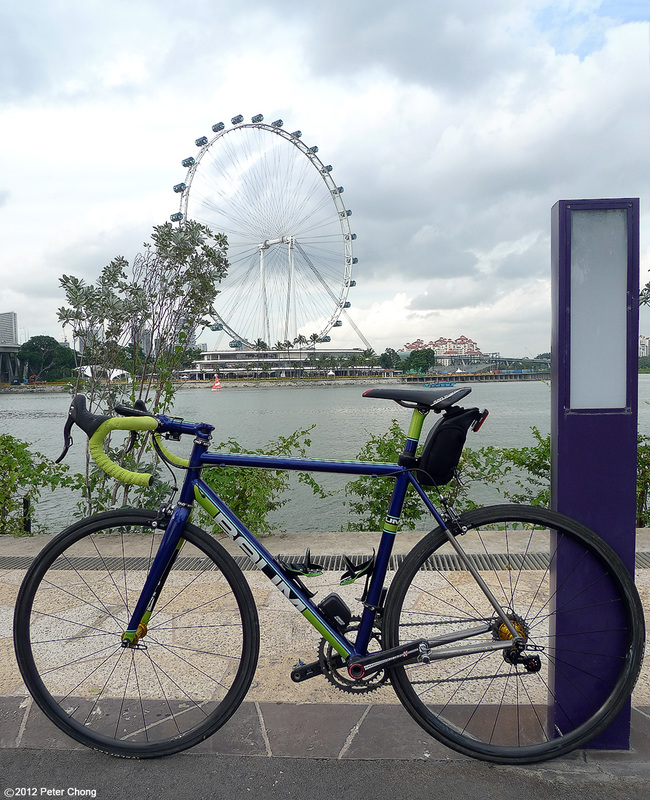 On the Marna Barrage, overlooking the Singapore Flyer. The result, as expected is the magic carpet ride people ascribe to titanium without the flex and with the stiffness of steel. Magnificent ride. Compliant, smooth, but with the ability to transfer every bit of power to the wheels. I feel I am riding one cog smaller than on the Pegoretti or Zullo. And I reached 50.5 kph at the Garden by the Bay East stretch without too much stress to my old ticker...I could have easily have gone faster...but only slowed down because some kids were rollerskating ahead of me, and I fear of crashing into them at that speed. My previous fastest speed at that stretch was 48 kph on the Pegoretti, but I noted at a higher heart rate and more apparent effort. I broke all my personal bests - for 1 hour cycling, and best times for 10km, 10 miles, 20 km, 50 km all within 3 rides over a week. The paintwork is fantastic...the pearlescent paint almost glows in the sunlight. Each weld prefect. The bike bears an Enve 2.0 fork, ARX carbon stem and a zero setback Enve seatpost, all painted to match the frame. 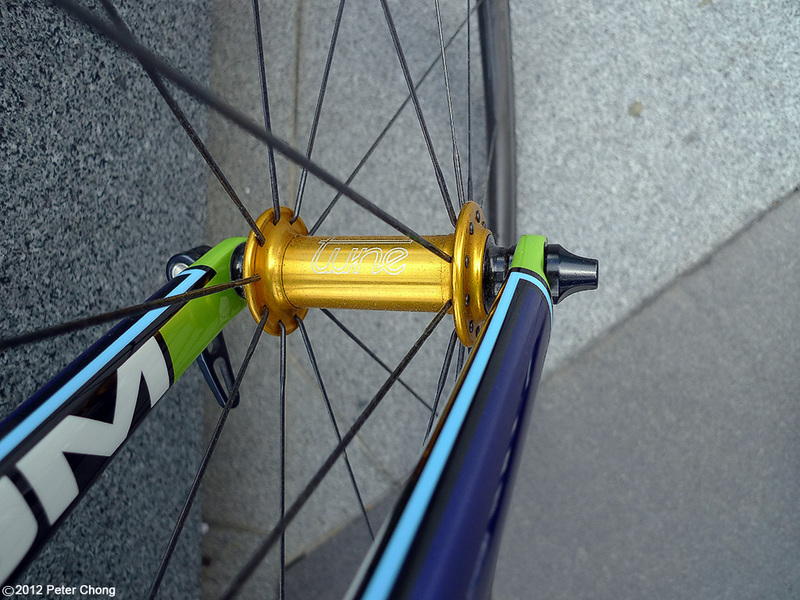 No expense was spared with the drivetrain...the Campagnolo Super Record 11 EPS. 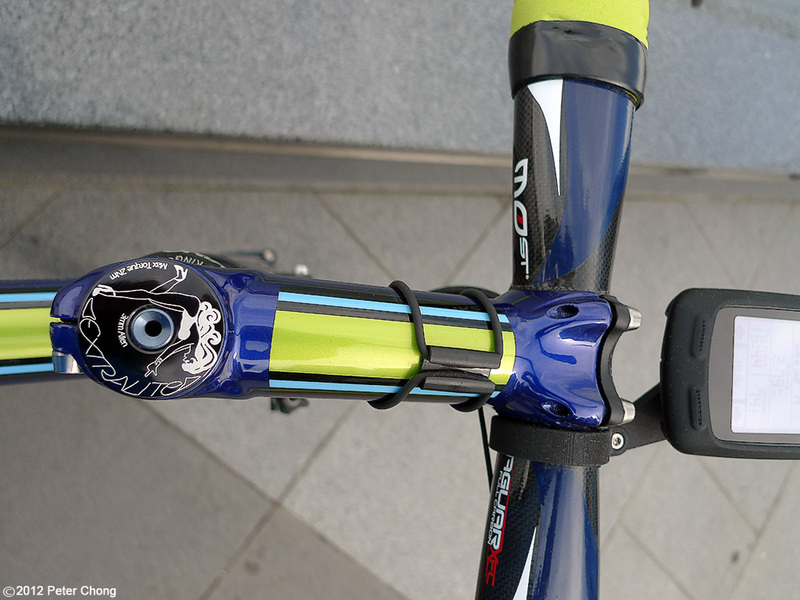 Not obvious in the photograph above, but the bottom bracket is specified as BB30 PressFit, to ensure stiffness. This might not have been the wisest choice, as the owner confesses to me later...as an adapter is required to fit the Campagnolo drivetrain onto the BB30, and this may sometimes cause creaking noises from the bottom bracket. Introduced in 2011, this electronic groupset is as good as it gets. 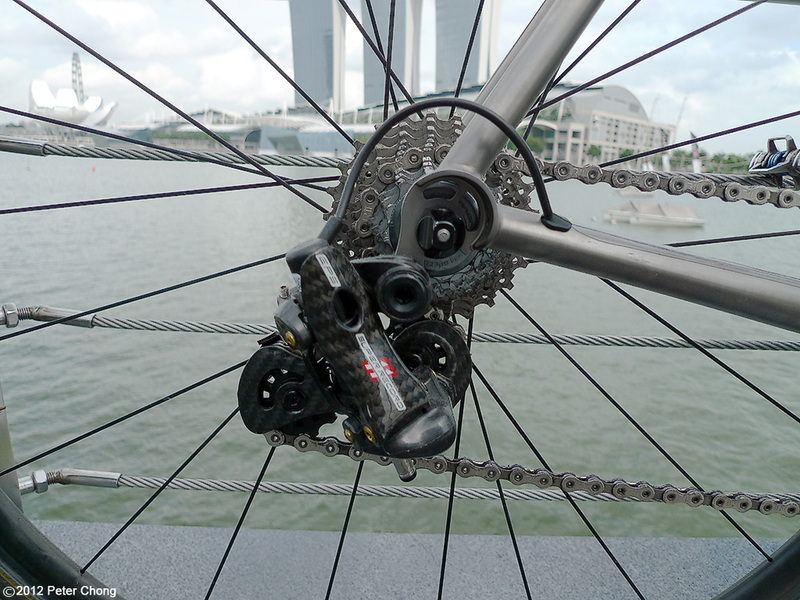 Shimano introduced their Di2 electronic groupset somewhat earlier in 2009. Campy's responded not only with a top of the line offering, but also with electronic capability to the Record and Athena. 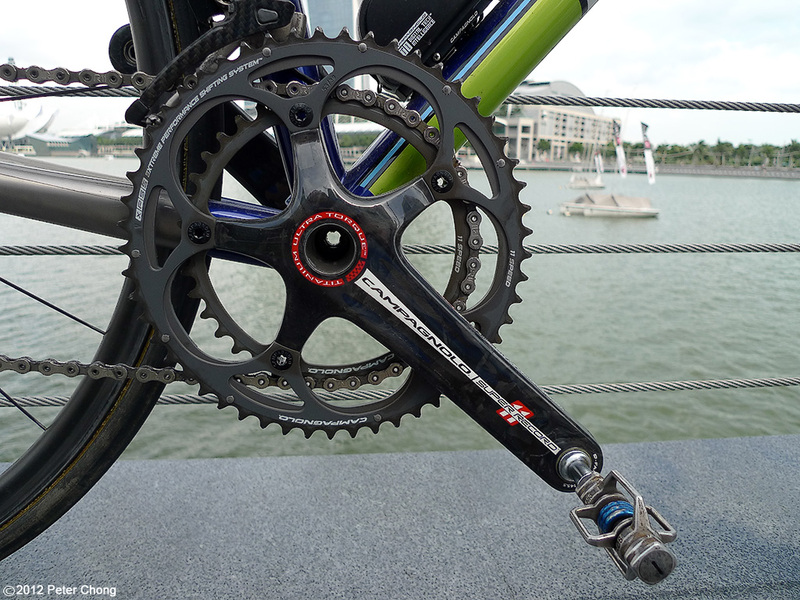 Campy's offering is also 11 speed, while Shimano only gets 11 speed in 2013. 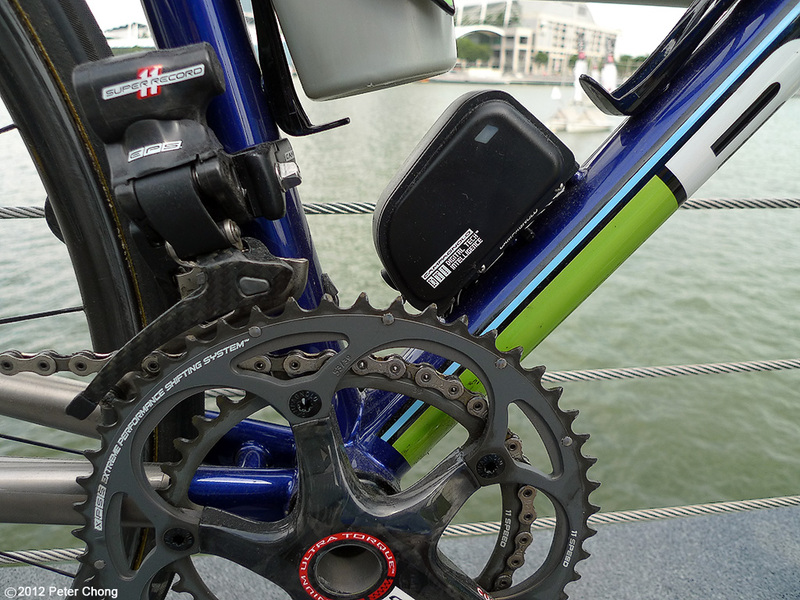 Two electronic units, one below the stem, as shown in the pic above, and another on the top side of the downtube, see pic above that, are employed to provide the electronic brains and battery power to do the shifting. The rear derailleur, showing the micro step motors which enable the shifting of the rear cogs. It would seem the system is a bit messy, but in practice, it works perfectly. Each shift is precise, very fast. And the system allows one to move across the entire rear cassette with one push of the up or down shift button, situated much like the mechanical Super Record on the hoods. But as these are electronic buttons instead of levers pulling a cable to actuate the shifts, the shifting is effortless. Until I had ridden on an electronic groupset, I also thought that this was an overkill system. A bit like a quartz watch...super accurate, but no soul...but this was not to be the case. The system is so beautifully put together, and works so well, I am dreading having to go back to a mechanical Athena 11 I have on my own bike. I installed my own Crank Brothers Egg Beaters SL on each of these "sponsored" bikes as I prefer to wear mountain bike shoes so I can walk normally when not on the bike. Though road shoes have stiffer soles and transfer power better, I prefer the convenience of being able to walk and as I am not racing, don't mind to lose out on the efficiency. 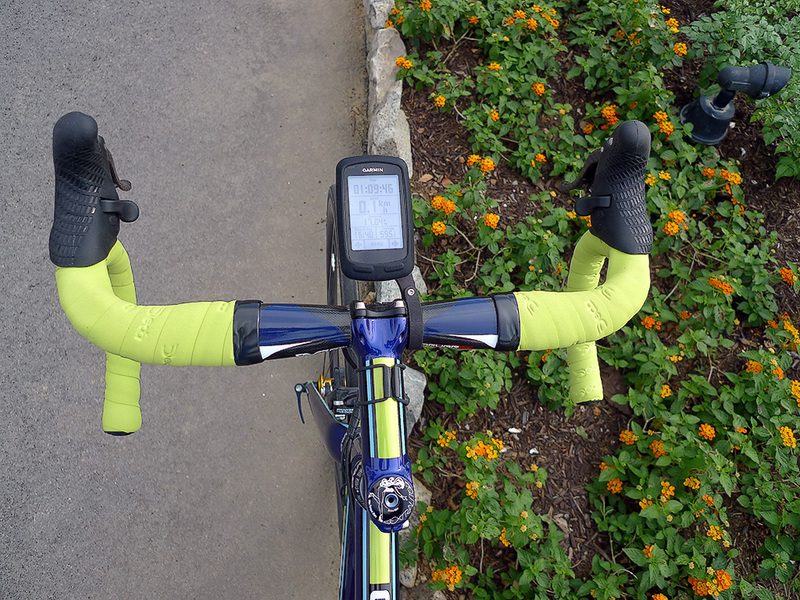 If I were to race, I would use Speedplay Zeros - light, low stack, and well designed. The wheelset on this build is the remarkable Enve 1.25 carbon tubular wheelset, laced onto Tune hubs. The hubs are very nicely balanced, and very smooth rolling. Tyres are Veloflex Extreme tubulars on latex tubes, which contributes also to the magic carper ride. I still preferred the FMB Challenge CX Silks on the Zullo MazSilenus, but the Veloflex is still a bit more comfortable than the Challenge Stradas. All at 105psi rear, 100 front pressures. Total weight for the bike as shown, including pedals, without the Topeak saddle bag was weighed to be 6.92kg on a digital scale. Headset is from Chris King with the Extralite cap, with the curious graphic characteristic of Extralite. 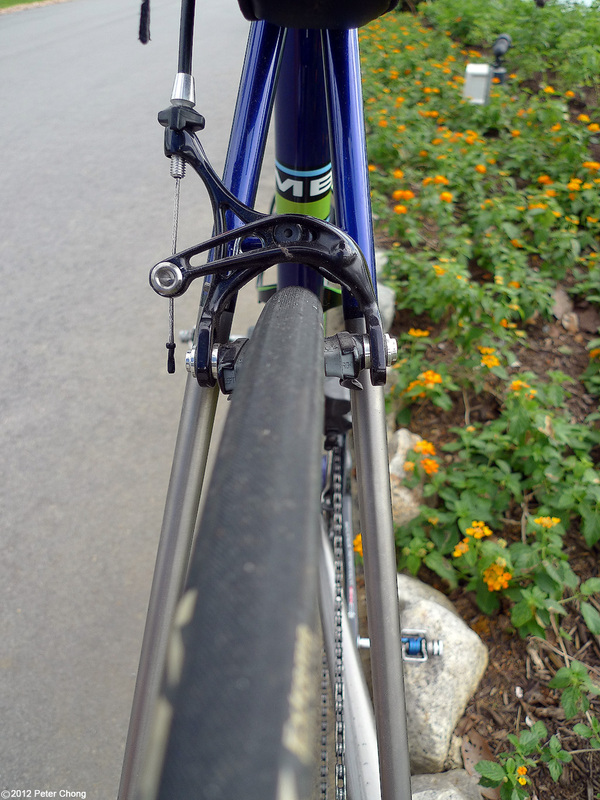 The brakes are Campagnolo Super Record skeletons, with the proprietary brake pads of the Enve rims. Though specified for 25mm tyres, there seem space to perhaps fit 28mm ones. 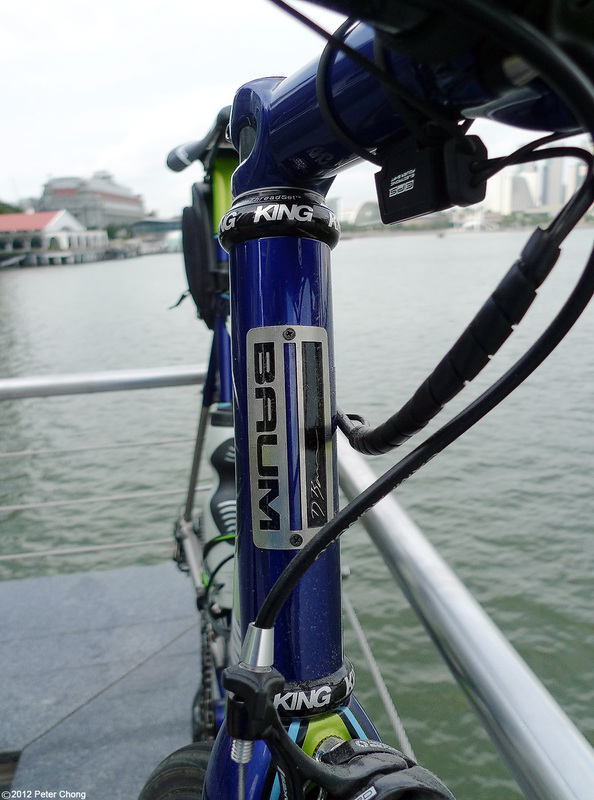 Note the beefy chainstays, which are essential to provide efficient transfer of power. 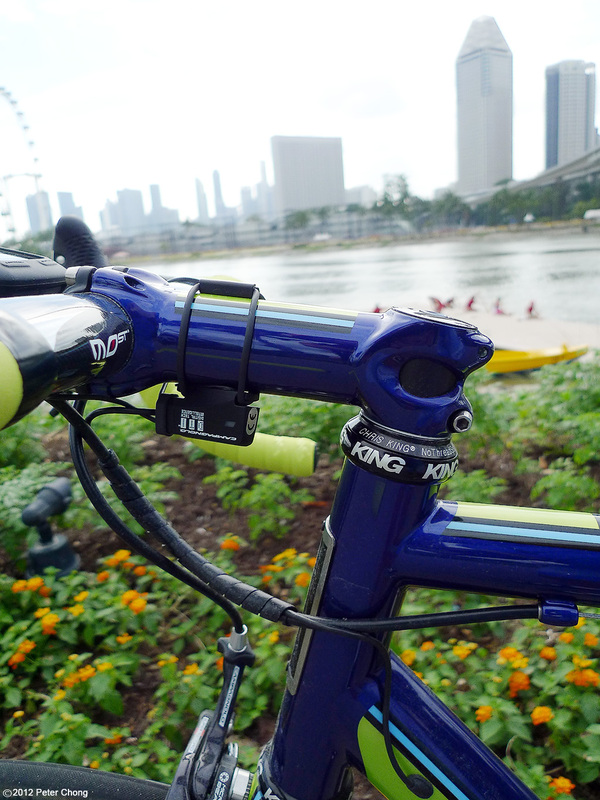 Photographed on site at the Marina Barrage, Gardens by the Bay and Marina Bay Sands area. I rode the bicycle for the shoot, and was only able to carry the small Panasonic Lumix LX-3 which took all these photographs. The image below also opens up to a 1920 wide wallpaper. On the Gardens by the Bay East, overlooking the climate control buildings of the Gardens by the Bay known as the Flower Dome and Cloud Forest conservatories, with Marina Bay Sands and the CBD skyline in the background.